Some say that God made the world, but the Dutch made the Netherlands. Global warming caused by CO2, however, risks undoing all their hard work by flooding the carefully managed lands. The Dutch therefore have a special interest in energy transition – the move from high carbon to low carbon sources of energy. They also recognise the engineering and social challenges implied and the Netherlands is one of the few countries seriously planning the transition. For the Dutch, as for most countries, the time pressure is acute, with European targets requiring reductions in carbon emissions of 80-95% before 2050. 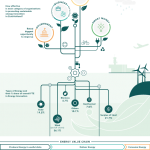 Within the Netherlands, Zuid-Holland is the second largest province and is responsible for a quarter of all national energy consumption and one third of all carbon emissions. The provincial government has ambitious plan to meet climate change targets: to reduce CO2 emissions from 44 megatonnes (MT) in 2013 to only 6 MT by 2050. For Concentra Analytics Europe, it was therefore an exciting challenge and a real compliment when the Province of Zuid-Holland asked Concentra for help in mapping out its energy innovation ecosystem. 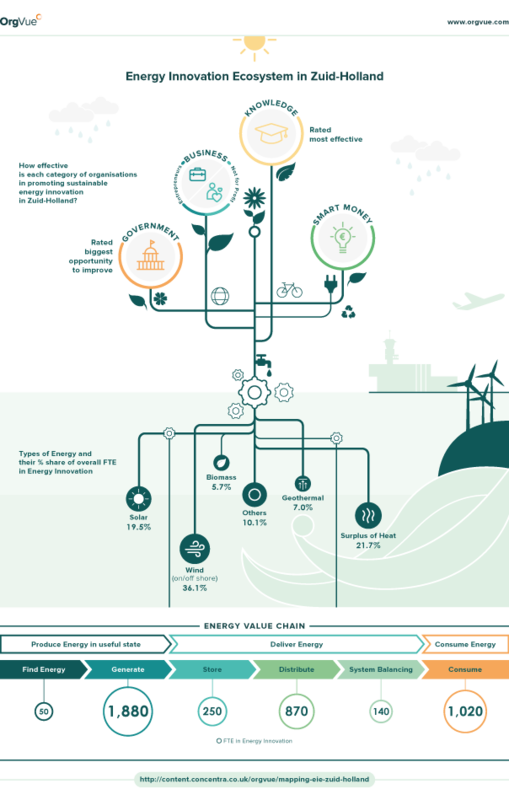 Infographic: Key highlights from “Mapping the Energy Innovation Ecosystem in Zuid-Holland” report. Interactive query network graph showing relations between orgnisations in the Energy Innovation Ecosystem. How can a whole Energy system evolve? Innovation doesn’t just happen. Innovation needs the right conditions. One well known theory is that it can be accelerated by the interaction between universities, industry and government – a ‘triple helix’ model. The Province of Zuid-Holland has great universities (in Rotterdam, Leiden and Utrecht). It has city, provincial and national government institutions centred in The Hague, and a strong industrial base. This study added a fourth quadrant – Finance – and even looked at the interaction between the quadrants. With more than 100 interviewees, and an innovative model mapping activity, networks and perceptions across all four quadrants, it gives new insights into the evolution of the energy ecosystem. We are therefore delighted to announce the publication of the final report, which you can download here. What are the activities most invested in right now in energy innovation in Zuid-Holland? Which energy types are getting most effort? What do people think are the blockers on progress towards a low-carbon energy environment? 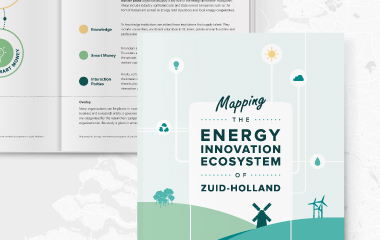 Key highlights from “Mapping the Energy Innovation Ecosystem in Zuid-Holland” report. 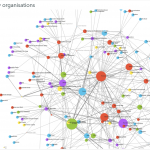 Below you can access and query a network graph showing relations between organisations. Download the full report here to find out more; and you can contact us for more information about replicating the study in your country or region here.